Yesterday, Chris Bagby (also known as my Dad and one of the Owners of Highland Woodworking) and I went to Winnona Park Elementary in Decatur, GA where we were interviewed by a class of 30 3rd graders taught by Mr. Matthew Hicks. The class is currently studying Entrepreneurship and they have had several business owners from around the Metro Atlanta area come in to discuss their businesses and how they got started. My Dad and I came with a stack of our newest Spring/Summer 2018 Catalogs to hand out to the students as well as a copy of our very first tool catalog printed back in 1982. To give the kids more of an idea of the products we sell, I also brought my Narex Spoon Carving Starter Kit which I started a few weeks ago at the Ormewood Park Makers Festival where Highland Woodworking had a booth promoting our store and woodworking classes. One of the main questions was how the business was started and what resources were needed in order to start the business. My Dad discussed how he and Sharon, my Mom, founded the business as Highland Hardware back in 1978, across the street from its current location in Virginia-Highlands. Armed with both a bank loan and a personal loan from Sharon’s parents, the two were able to rent the building at 1034 N. Highland Ave for just $500 a month. He emphasized the importance of capital, a dedicated staff, and an attractive storefront/layout as important resources for starting a business. We had a fun time answering the kids creative questions and getting them (hopefully) interested in woodworking as well as in possibly starting their own businesses in the future. 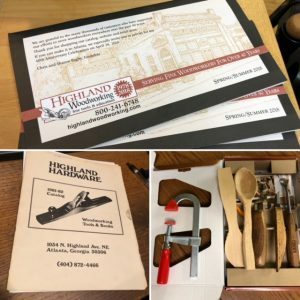 If you want to read more about the history of Highland Woodworking, check out our About Us page on our website. Good Clean Fun: An Interview with (and a store visit from) Nick Offerman!